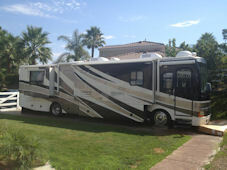 Unit has 4 slides, plus hydraulic leveling jacks as well as the standard Motor Home equipment. Unit has a Living Room with TV, DVD and Stereo. Complete Kitchen with Oven, Stove, Microwave, and Refrigerator/ Freezer. Bathroom has a Sink, Toilet and a Shower. It has Air Conditioning, a Furnace as well as a Generator to power everything even in remote areas.